President Trump says the North Korean nuclear threat has dissipated since he signed a brief and vague joint statement with the country’s leader, Kim Jong Un, on June 12. This claim overnight became a key part of Trump’s repertoire. The president has been making assurances about North Korea in virtually all of his public remarks. On June 15, he went so far as to say he had “solved” the problem. But experts say Trump is getting ahead of himself and is exaggerating or flubbing sensitive details. The agreement with Kim is light on specifics, and much is riding on international negotiations now taking place. The threat, for now, is still looming. In his 1987 bestseller, “The Art of the Deal,” Trump described how he would use “truthful hyperbole” as a “very effective form of promotion” in his business dealings. But the stakes are much higher in the realm of nuclear weapons. So we’ve rounded up several of his claims about the North Korea denuclearization agreement and recent developments. North Korea on May 24 announced the demolition of the Punggye-ri nuclear test site, an underground facility where it conducted six tests of nuclear bombs from October 2006 to September 2017. The apparent demolition happened before Trump and Kim signed their agreement June 12. When North Korean officials first announced their intention to cease nuclear testing, on April 20, the stated reason was that the country “had successfully attained the nuclear weapons designs that it sought over the course of six tests,” according to the Diplomat. In other words, North Korea said it decided to stop testing nuclear bombs once it figured out how to build the one it wanted. U.S. officials suspect the 2017 test involved a hydrogen bomb. “The apparent demolition was widely seen as a diplomatic gesture toward Washington, even as it remained unclear whether the made-for-TV blasts marked any significant change in the North’s nuclear capabilities,” The Washington Post’s Anna Fifield reported. The extent of the damage inside the sprawling Punggye-ri facility is unknown, so there’s a possibility the test site could be reused. Jeffrey Lewis, director of the East Asia nonproliferation program at the Center for Nonproliferation Studies, said North Korea blew up the entrances to three tunnels that lead to the testing site. But it may be possible to rehabilitate them, he said, just as it may be possible to dig new tunnels. According to 38 North, a website with expert analysis on North Korea run by the Stimson Center, the two-story headquarters building and numerous support camps at the Punggye-ri site “appear untouched” after the demolition. During previous negotiations with North Korea, the George W. Bush administration requested a “visual” that would show the public progress toward denuclearization, Lewis said. North Korea bombed a cooling tower servicing a nuclear reactor at a different nuclear research site, in Yongbyon. When negotiations broke down, though, North Korea built a pump house that connected the Yongbyon reactor to a river, Lewis said. This maneuver “sort of blinded” President Barack Obama’s administration and led to “complacency,” he added. The lesson is that appearances can be deceiving. “The North Koreans took a showy but easily reversible step and then we didn’t notice it when they reversed it in an unexpected way,” Lewis said. While it is notable that North Korea has stopped full-on testing of nuclear weapons, the country has not indicated it is stopping other kinds of tests with lower nuclear yields, Lewis said, such as subcritical or hydronuclear testing. “Now we’re into kind of very uncertain territory because we don’t know how sophisticated North Korea diagnostics are, so we don’t know what they could learn from subcritical or hydronuclear testing,” he said. “We learn quite a bit from subcritical testing” in the United States, he added. Although the Punggye-ri testing site appears to have been demolished, the Yongbyon facility — North Korea’s key nuclear research site — remains operational. The Wall Street Journal reported June 27 that “North Korea is upgrading its nuclear research center at a rapid pace,” pointing to a satellite imagery analysis by 38 North showing evidence of new construction, including around an experimental light water reactor (ELWR). “The necessary infrastructure for reactor operations at the ELWR appears externally complete, but there is no visible evidence yet to suggest that operations have begun,” 38 North found. The evidence strongly indicates that North Korea’s nuclear research hasn’t ceased, contrary to Trump’s claim June 12. The president on June 21 said North Korea had blown up “four of its big test sites.” Assuming Punggye-ri is closed for good, that’s one. Satellite imagery shows the North Koreans destroyed a missile test stand north of the city of Kusong, according to 38 North. That would be two. But “there have been no alterations or activity akin to dismantlement to any of the six known launch and engine test facilities and two ejection test stands,” 38 North reported June 15. Trump and Kim’s denuclearization agreement is light on details, and its success would depend on the result of difficult negotiations. It’s far too early to say Trump has “solved” the problem posed by North Korea’s nuclear weapons. Testifying before a Senate subcommittee June 27, Secretary of State Mike Pompeo said North Korea remains a threat despite Trump’s assertions. “I’m confident what he intended there was, ‘We did reduce the threat,’ ” Pompeo said. “I don’t think there’s any doubt about that.” The Department of Defense, meanwhile, is spending billions of dollars preparing to counter a North Korean nuclear threat, as The Washington Post’s Paul Sonne reported. As we’ve reported, the practical meaning of these phrases is not defined, and “toward” is rather weak. In the past, North Korea viewed “denuclearization” to mean the United States removing the nuclear umbrella it provides to Japan and South Korea; there is no indication its definition has changed. There is no specific commitment to end nuclear testing, research or missile launches (although missile tests have stopped). In his memoir, “Surrender is not an Option,” Bolton faulted a follow-on statement to a 2005 agreement with North Korea, issued Feb. 13, 2007, as “radically incomplete,” even though it included a detailed road map for the “eventual abandonment” of the Yongbyon nuclear facility. He noted it did not deal with North Korea’s existing stockpile of nuclear weapons, contained “no verification provisions whatsoever” and failed to address the issue of Japanese and South Korean abductees. None of those elements is in the statement Trump signed with such fanfare. North Korean officials have long signaled that they possess the remains of American soldiers from the Korean War, according to the Defense Department, but repatriation efforts have stalled for the past decade. North Korea returned remains as recently as 1994. June 23: Trump announced 200 remains had been returned. The same day, South Korean media reported that 30 U.S. military vehicles, carrying 215 caskets, were expected to move into North Korea within 24 hours. Carroll denied this report. The Associated Press reported that “100 wooden ‘temporary transit cases’ sent to the Joint Security Area at the border were part of preparations to ‘receive and transport remains in a dignified manner when we get the call to do so,’ ” quoting Carroll. Notice the last part of his quote. June 27: Pompeo told the Senate subcommittee he was “optimistic” that “some remains [would be returned] in the not-too-distant future.” When pressed, he said, “We have not yet physically received” any remains. So, Trump said 200 veterans’ remains had been returned, and four days later, under oath, his secretary of state contradicted him. A Pentagon spokesman, Lt. Col. David Eastburn, reiterated what Carroll said. “United Nations Command is planning for the repatriation of the remains of U.S. service members,” Eastburn told The Fact Checker, but he declined to say when that would happen. The State Department referred us to the White House for further clarification, but we received no response. However, as Bump points out, considering that close to 82,000 Americans were older than 100 in 2016, Trump’s claim that thousands of parents of lost Korean War veterans were approaching him with an identical request beggars belief. Children or grandchildren making this request of Trump seems much more likely. The children of soldiers who went missing in the Korean War would have been in their early to mid-60s at the time of the 2016 election. Trump has held at least 350 rallies in his political career, according to one list. Assuming that “thousands and thousands” means 2,000 at minimum, an average 5.7 people per rally would have to be making this one specific request of the president. It’s not clear from Trump’s remarks whether he was hearing these requests personally or secondhand, and it’s also unclear how often Trump lingers at his rallies to speak with attendees. We asked the White House for evidence to back up these claims from the president but did not hear back. These statements from Trump are all similar in that there’s a possible kernel of truth in each, but it’s layered with misinformation or puffery. The president is repeating these claims on a near-daily basis, on Twitter and in almost every public appearance, and his audiences easily could be lulled into the mistaken belief that North Korea no longer presents a nuclear threat or is moving quickly to disarm itself. Trump clearly has high hopes on North Korea, and his administration’s efforts could yield dividends in the future. 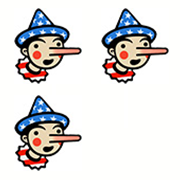 But for now, the president is counting his chickens before they hatch and his claims warrant Three Pinocchios.